What is a "chugger?" I’m sure you’ve seen them. The word is a combination of "charity" and "mugger," and refers to individuals on the streets, who stop you and try to convince you to do something charitable—and they want you to do it… with them… right… now. I used to avoid these groups. I didn’t want to be bothered for a number of reasons. Many times,I was truly in route to get somewhere and could not afford to be late. Other times, I just didn’t feel like talking to anyone. However, most of the time, I was just avoiding saying “yes” to someone, because “yes” meant less money for me each month. Less money was a big deal, and I had to think about that. If I had to think about it, I would have to tell them “no.” I didn’t want to have to tell them “no,” so I’d keep walking as they approached. Earlier this year Lenny Ciotti, my dear husband, became a “chugger.” I actually didn’t like the term the first time I heard it. I preferred “street fundraiser,” but he didn’t mind it. He was passionate about the cause and a good salesman. He said, “If I’m going to convince someone to spend money, I’d rather do it to help people.” He did his research, chose Children’s International for his cause, and went for it. For seven months and counting—in ALL weather: snow, rain, heat—he spends nine hours on the street each day talking to people. Even when he tells people that there are 1,000 children dying DAILY across the globe from preventable illnesses, they still say, "No." I bring him lunch most days. Sometimes, I hang back and watch him with his young team (which he named the “CI-Joes”). He gives them high-fives and tells them that hey CAN do it—they CAN find sponsors. I listen to what the team says to people and how people respond. Many are unemployed or are in school, or are single moms and dads, who really can’t afford an extra expense of $28 a month. They let those folks go by and thank them for stopping. But most of the time, Lenny’s team battles apathy and fear. They hear a thousand not-nows and pick-someone-elses and I-have-to-think-about-its. Sometimes Lenny wishes that it really could all be done online, and that people would have the initiative to seek out those in need without him having to interrupt their day. But in reality, street and door-to-door canvassers still bring in the majority of aid to charities. For now, it takes direct human contact to get someone to notice, care, and act. Lenny understands the people he meets, but it’s a challenge. He knows the streets can be over-canvassed. He knows that people do not want to appear uncharitable. He knows that there are scams and frauds and that people are cautious. He knows that his organization is not the only one trying to make a difference. He knows that it's their choice where they put their money. He understands that they have doubts that their money will actually change a life. He knows they’re afraid. He understands… but there are times when he just doesn’t understand. Recently, Lenny went to Washington D.C. to canvas in a different neighborhood for a week and I tagged along. After nearly four days of rejection, he felt weathered and tried. He was battling hopelessness. Why couldn’t he inspire people? Why couldn’t he reach them? After another long day, I convinced him to take a break and go to the Lincoln Memorial, but when we arrived, he was still in such a state that I had to leave him to himself for a while to regroup. He was exhausted from the heat, dismayed. Lenny leaned against a column and decided to meditate and pray—holding his daily reprieve. He reminded himself that causes were worth backing, that he was no judge of people’s inaction, and that he had to choose to not lose hope in humanity. After a while he calmed, and we continued on our walk, speaking philosophically and taking in the night. Only a few hours until bedtime and a few hours more, before he would be back out there, back on the streets, trying to get more kids off the waiting list. I remind him that he’s personally changed over two hundred and fifty children’s lives since he began this job. But he looks at me as if that’s nothing. Maybe statistically it’s nothing with so many injustices in the world. But I know the lives of those kids are changed forever, and it’s because he was bold enough to interrupt someone’s day. I hope I can be more like him. 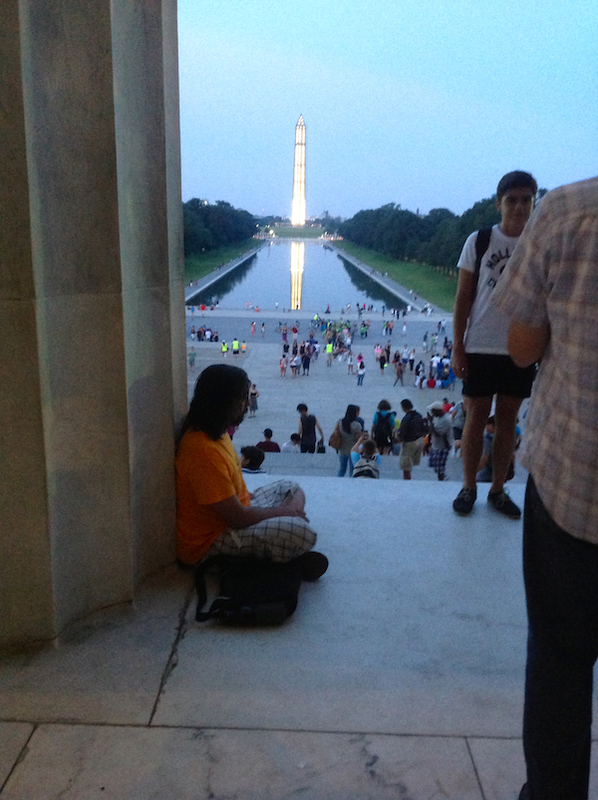 Photo of Lenny Ciotti at the Lincoln Memorial looking onto the Washington Monument by Elise McMullen-Ciotti. 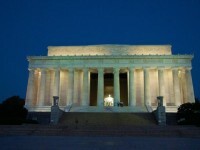 Photo of Lincoln Memorial by Tumblr.